After his mother was kidnapped and taken to Pyongyang, Pak Jun Do grew up in an orphanage called Long Tomorrows. In turn he became a tunnel soldier, a kidnapper, a transcriber aboard a fishing vessel, and another person entirely. In Adam Johnson's version of North Korea, Jun Do has almost no control over his life, but must constantly adapt to changes thrown his way in an effort to survive, until he eventually finds a way to take matters into his own hands. And all the while, the loudspeakers address citizens with news from around the nation, and world news from countries they consider oppressive, like South Korea, Japan, and the United States. Also broadcast is a reading of the year's Best North Korea Story, a story about the actress Sun Moon and her husband Commander Ga, which may not be fiction at all, but the story of Jun Do's reality. In a country built upon propaganda and lies it's hard to know what to believe, and the same goes for this story. It is both bleak and absurd, a combination that reminds me of many Russian novels I've read. Also similar is the fear and paranoia that everyone lives with. An unnamed narrator who works as an interrogator lives with his elderly parents, who even in their own home speak only in stock government-approved phrases. Such is the fear of prison and death which permeates the lives of everyone in the book. Even those who work high up in the government aren't immune. Anybody's life could change in an instant, with no warning and no explanation. Jun Do maintains that he was not an orphan like the other kids at Long Tomorrows. He thinks his mother is still alive out there somewhere and says that the Orphan Master, the man who ran the orphanage, is actually his father. Throughout the book I doubted whether this was true, but he didn't ever revisit the issue - I don't think he ever even thought about the man who was supposed to be his father, though he wondered about his mother's fate now and then. One of Johnson's major themes is the way that lives change and people just need to keep going in their new story without looking back. The apparent ease with which everyone accepted their separations from one another was a bit heartbreaking. The North Koreans view their country as democratic and consider themselves very well off compared to other nations. When a group of Texans came to visit, the Koreans planned to give them food aid, as so many Americans are starving. The statistic they quoted, by the way - that 1 of 6 Americans goes hungry every day - is accurate, which just goes to show you how thin the line between propaganda and the truth. Meanwhile, of course, North Korean citizens were keeping themselves fed with bark from trees, and other things I just don't want to even think about. I'm a little upset at Adam Johnson for even putting some of these images in my head. There's actually a lot of graphic imagery throughout the story. In addition to the aforementioned desperate measures of starving people, we get a pretty close-up look at North Korean methods of interrogation. These scenes aren't especially frequent, but they're pretty horrifying, so if that sort of thing upsets you, you may want to steer clear. But I suppose anyone who only wants to read about pleasant things isn't going to pick up a book about North Korea. 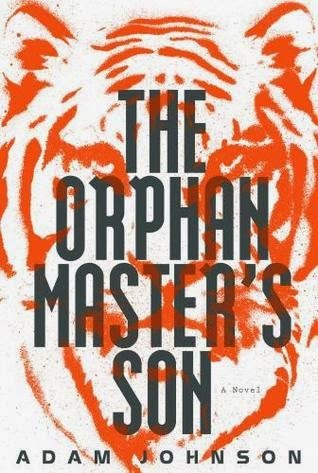 I was intrigued by The Orphan Master's Son since I first read reviews upon its publication. Little is written about North Korea, and I wondered how this American author did his research. It turns out that he spent some time in North Korea as part of his extensive research, a trip I'd really like to hear more about. The only other book I've ever read that was about North Korea was Escape From Camp 14 which only made me want to learn more about this mysterious country. The two books were remarkably similar in the blurring of lines between fact and fiction, despite one of them being fiction and the other non-fiction. When The Orphan Master's Son won the Pulitzer, I actually became a bit wary of it, fearing that it might be dense and unreadable as many literary novels are. But I was pleasantly surprised. Not only has Johnson taken us inside a fascinating world - and one you only want to visit for a brief time - but he's populated it with people you really want to take with you when you leave. I wanted nothing more than to get Jun Do out of there. I wished it wasn't so long, but it was gripping enough to hold my attention throughout, and in the end it was absolutely worth it.